Although October is Down syndrome awareness month, every day is full of awareness for families and friends of those affected by Down syndrome. Show that you love, support and understand Down syndrome by wearing your Personalized Down Syndrome Awareness Shirt at your next community walk event. 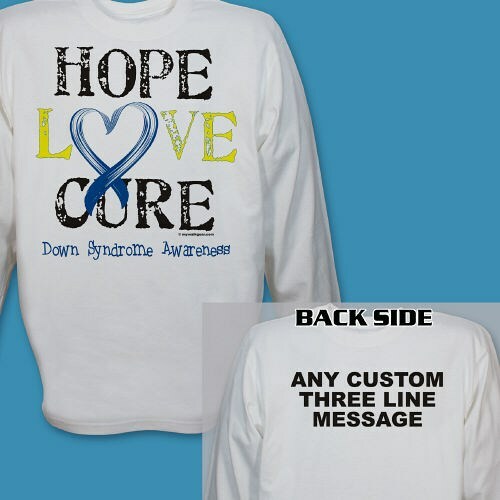 Our Personalized Down Syndrome Long Sleeve Shirt is great for any upcoming Down syndrome Awareness Walk Event and shows that you too are there to support and help spread awareness. Our Personalized Down Syndrome Awareness Shirts are available on our premium 100% cotton long sleeve shirt, machine washable in youth S-L and adult sizes S-2XL. Includes FREE Personalization! We will personalize the front of each shirt with any three line custom message. Additional Info Our Down Syndrome Awareness Shirts and Walk Gear are great for fundraisers, walks, awareness campaigns, and gifts. Select from our wide variety of products designed and priced to make it easy to raise funds, create awareness, and motivate volunteers. Be sure to also take a look at our Hope Love Cure Down Syndrome Awareness Hat and our Personalized Hope Love Cure Down Syndrome Awareness T-Shirt to help spread awareness every day.